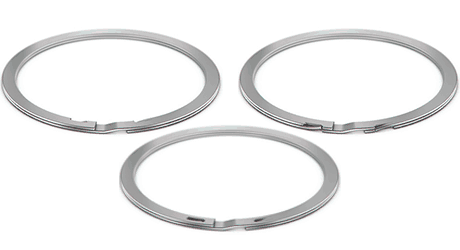 TFC offers an array of standard retaining rings for different automotive applications. Selecting the appropriate ring requires an understanding of the application requirements, which includes thrust load, groove dimensions, and many others. If your application rotates at high speeds, the rotational capacity of the retaining ring will be important to consider. These rings have a tab that “lock” into a slot on the outside diameter or in the centre-line of the radial wall. This lock keeps the ring’s diameter from expanding. In addition to preventing the ring from expanding, the self-locking feature can also help the ring to better withstand vibration, rapid acceleration, and degree of impact loading. Sometimes the self-locking feature is even used on internal retaining rings to help with vibration and impact loading, even though rotational capacity is not a concern. Self-locking rings are often specified for transmission and gearbox applications. Rings are the main retention method within the assemblies to retain high speed rotating gears and bearings. These components are obviously critical to the function of the gearbox or transmission. This rotation can often exceed the rotational capacity for many retaining rings, and if a ring slips out of place, the entire assembly can fail, causing serious damage. With the technological advances of electric cars, the electric motors used to power the wheels are subjects to rapid acceleration, vibration, and of course high RPMs. A Smalley self-locking ring can be used to prevent damage or premature failures of the motors and/or their individual components. Besides automotive applications, self-locking rings are used in many other designs, including aerospace and industrial. Smalley can also manufacture these rings in different materials depending on the environmental requirements, or with the locking mechanisms in different positions depending on your needs. Smalley engineers are ready to help you design the perfect self-locking retaining ring for your application contact them now to find out which self-locking rings will suit your automotive application.